now not as standing frontal figures but as celebrants who bend towards the altar and hold out scrolls inscribed with the opening words of the 'secret' prayers, chosen from among the very texts assembled in the parchment 'liturgical' rolls described above.25 Their number was constantly being increased over the centuries: celebrants line the bema walls as well as the apse, and above them, rows of busts in medallions were added, as though all the bishops in the history of the church were imagined as present, concelebrating in a single sanctuary. 26 E.g. 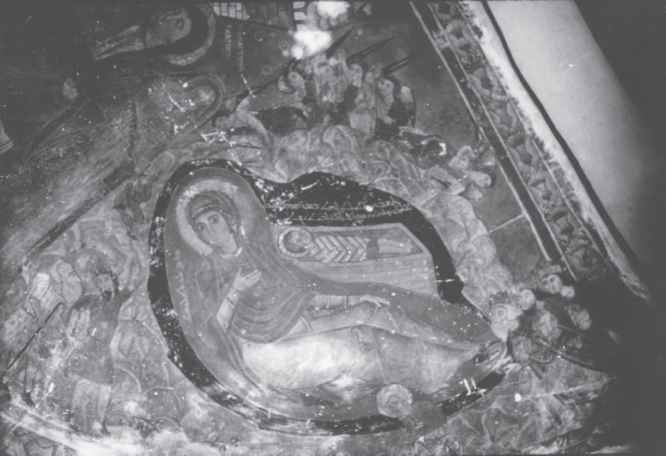 the Hetoimasia (with dove as well) at Nerezi: I. Sinkevic, The church of St. Panteleimon at Nerezi: architecture, programme, patronage (Wiesbaden: Reichert Verlag, 2000), 35-6; Gerstel, Sacred mysteries, 37-47; A. L. Townsley, 'Eucharistic doctrine and the liturgy in late Byzantine painting', Oriens Christianus, ser. iv. 22 (1974), 138-53. 27 L. Hadermann-Misguich, Kurbinovo: les fresques de Saint-Georges et la peinture byzantine du XlIe siècle [Bibliothèque de Byzantion 6] (Brussels: Editions de Byzantion, 1975), 67-78. 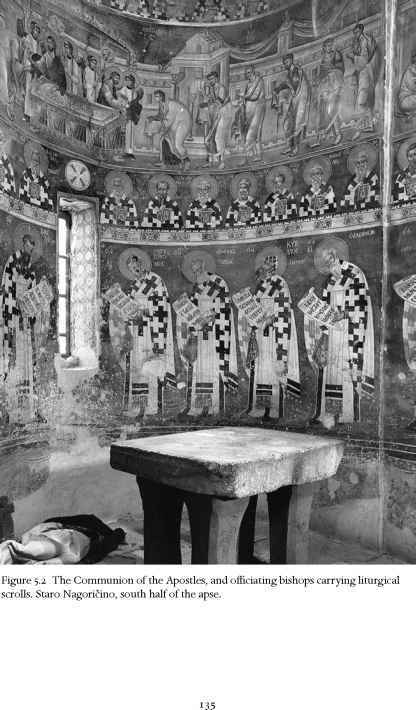 28 R. F. Taft, 'Melismos and comminution: the fraction and its symbolism in the Byzantine tradition', Studia Anselmiana 95 (1988), 531-52. 29 Pott, Reforme, 169-94; Schulz, Byzantine liturgy, 64-7. 30 Gerstel, Sacred mysteries, 68-77.